Bead Stringing Materials - Beading Threads - With so many exciting Bead Stringing Materials available, you’ll be busy for awhile! 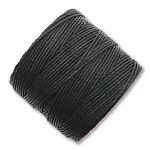 Leather or Suede Cord, S-Lon, Silk Bead Cord, Nylon Cord - the list goes on and on. Need an un-breakable Stringing Material? Try Tiger Tail. Choices of how to String 'em Along are endless, and so is the beautiful Jewelry Designs you can make with these Stringing Materials.